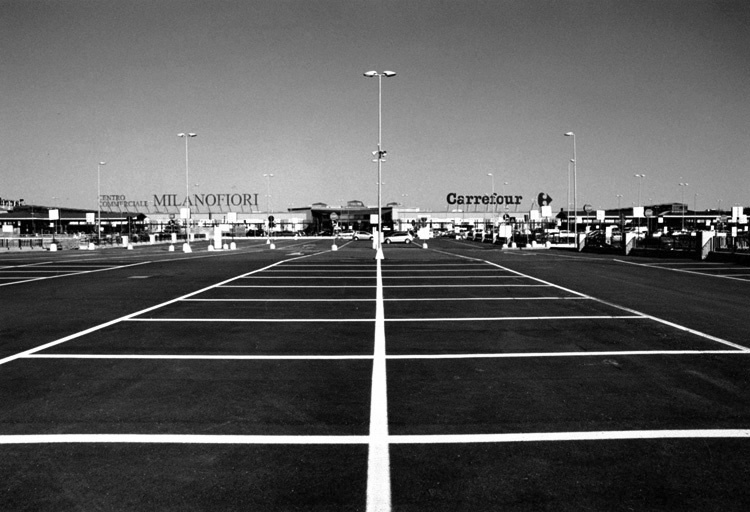 It is a work of 17 pictures dedicated to parking lots of commercial areas of the Milan hinterland. The pictures have been taken when the different malls were regularly open. Our aim was to wonder about the way the hinterland panorama of a big city, such as Milan, has been modified by the humans during the last ten-year-period. Besides, choosing to talk about hinterland through the parking lots, seemed to be stimulating, since the whole area is mainly considered as a big parking, a dormitory for the ones that every day have to enter Milan to work and to earn a living. To this mainly documentary intent, we put on top another more symbolic matrix. These huge spaces, meticulously organized and split in small units, thanks to the paint lines on the ground, just enough to contain a car, turned out to be rich of disquieting suggestions, almost a metaphor of a more general attempt of common placement.